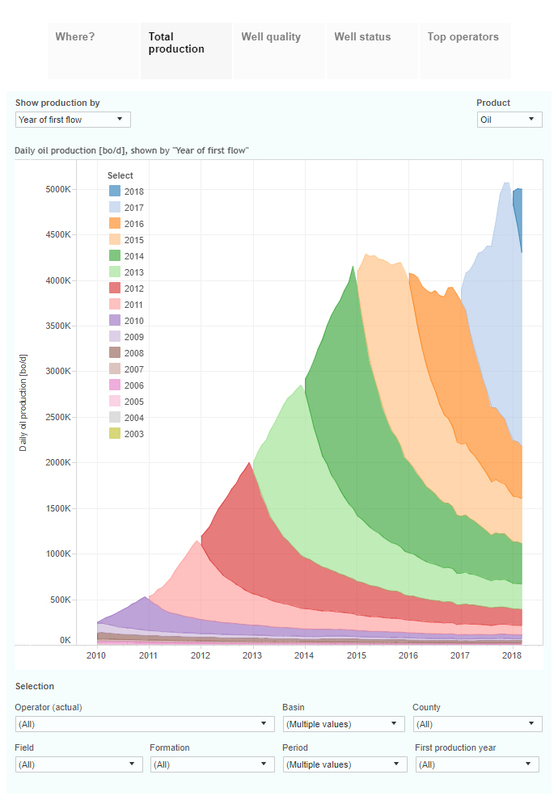 This interactive presentation contains the latest oil & gas production data through March, from 88,617 horizontal wells in 10 US states. 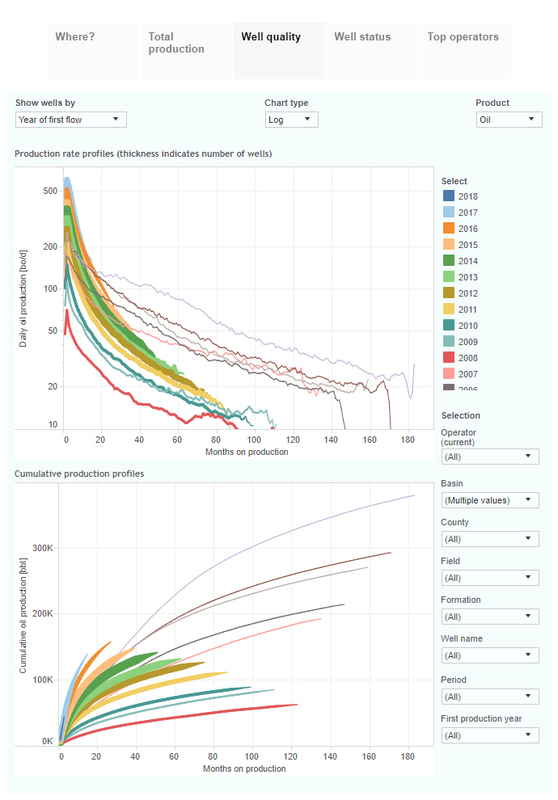 Cumulative oil and gas production from these wells reached 8.6 Gbo and 94.2 Tcf. The latest data for Ohio, which just released Q1 production figures, is also included. Only data for West Virginia is not up-to-date, and therefore this state has been deselected in most views. With the surge in drilling and completion activity since early 2017 both oil and gas production from these horizontal wells reached new records in recent months, at over 5 million bo/d and 50 Bcf/d. Current production is heavily dependent on recent completions, as the decline rates are high; for example, oil production from wells that started producing before 2015 is contributing just 23% of current production, as shown by the top of the dark green area in the above graph. Between the basins there are major differences, with some setting records each month (Permian, Appalachia, Niobrara), while others have not fully recovered yet (Eagle Ford, Haynesville), and a few appear to be in terminal decline (Barnett, Granite Wash). The major underlying reason for these differences is changing well productivity, which can be analyzed in the ‘Well quality’ tab. Note that the oily basins have been preselected in the ‘Basin’ filter, which you can manually adjust. 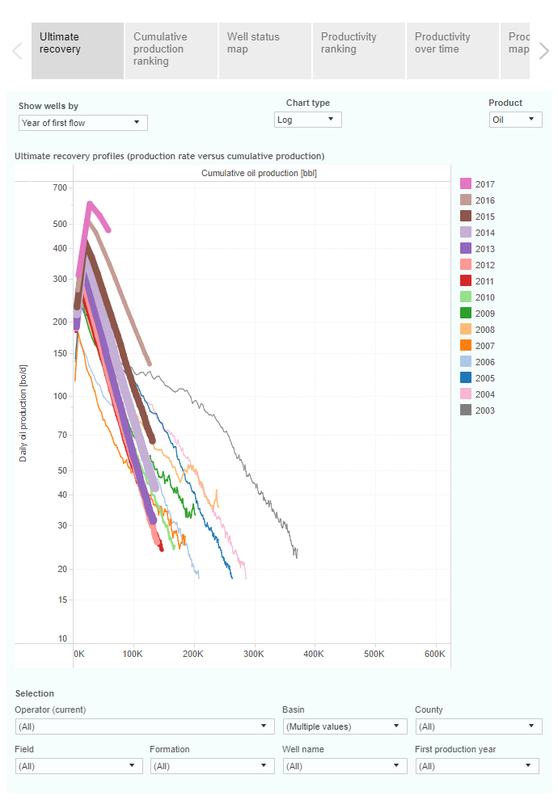 This “Ultimate recovery” overview shows the relationship between cumulative production, and production rates, over time. Also here the oil basins are preselected, and wells are grouped by the year in which production started. The major increase in initial well performance in the past 2 years is clearly visible here. Later this week I will have a new post on North Dakota, which just released May production. Next week we will be present at the URTeC in Houston, so if you like to know more about our upcoming analytics services, come visit our booth.